Mack in Rising Sun, Indiana, 2003. 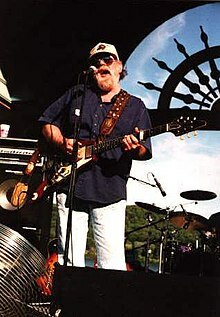 Lonnie McIntosh (July 18, 1941 – April 21, 2016), known by his stage name, Lonnie Mack, was an American rock, blues, and country singer-guitarist. As a featured artist, his recording career lasted from 1963 to 1990. He remained active as a performer into the early 2000s. Mack is also called one of the finer "blue-eyed soul" singers of his era. Mack died of natural causes in Smithville, Tennessee on April 21, 2016, aged 74. He was buried at his hometown in Aurora, Indiana near the Ohio River. ↑ "LONNIE MACK, JULY 18, 1941 - APRIL 21, 2016". alligator.com. ↑ See, section entitled "Blue-eyed soul ballads". This page was last changed on 30 July 2018, at 19:53.